Consequently I’m now in spring-cleaning mode, with the urge to really get organised with my research files. And to be honest to actually find out what’s really inside them. I seem to have all sorts of useful, but now forgotten research material, half written texts, references, downloaded pdfs, etc, squirreled away on my desktop. Since this time last year Mendeley has become an essential organisational tool for my growing research library but I’ve found the system I’ve set for for note taking on my reading – first using Mendeley’s annoyingly cramped notes panel then transferring longer summaries and commentaries to Word – is now overly cumbersome. Although I do like the idea that my notes are linked so clearly with my sources. I’ve had copy of DEVONthink (DT to me) in my desktop for some months now, recommended to me by another student in the faculty research training sessions, but haven’t really dared to use it. I’ve tentatively dropped in a few pdfs and bookmarks but that’s been all. I’ve found its layout rather daunting up until now, afraid that if I put something in there I’ll never find it again. And the manual is just too detailed for a beginner like me. I didn’t know where to start! 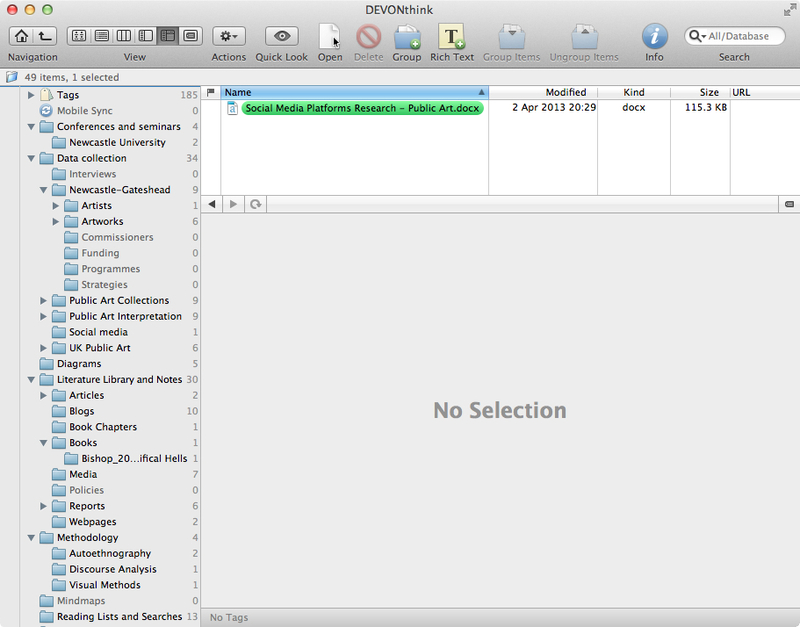 But, thanks to a really helpful series of blog posts by history researcher Rachel Leow, that I read in bed the other night (sad Phd-er that I’ve become) I’ve decided to have another go with DT – taking the opportunity to clear out my current desktop folders, and really see what’s in there. Both to review what have I been doing over the last year and hopefully to set up a more workable and productive structure that I can work with from this point on. I’ll probably tinker with this system, as it gets more populated, but for now it seems to be making sense. I’ll post on this again at some point to reflect on how this is working. Meanwhile I’d be interested to hear from fellow PhD-ers and researchers about your working practices with DT or other organisational systems for managing research materials, brilliant random thoughts, draft writing, fieldnotes, etc. And thanks again to Rachel Leow for giving me confidence to get going with DT.